I’m sure most of my readers and followers from LA know about the famous Kogi BBQ truck. The Alibi Room in Culver City is the Kogi Truck taste kitchen, where Chef Roy Choi’s famous Kogi specialities are featured on the menu. The Alibi Room is a micro-brew and wine bar with a menu offering fushion food from Kogi’s Kitchen (a mix of Korean BBQ & Mexican). They also has specialty & unique cocktails. The place is a casual lounge- it’s tiny but has a cool & laid back vibe. The food is great, the cocktails are unique, and it’s a great place to chill with friends. The drinks are great, and there are two items on the menu that I highly recommend. Read below to find out what I think is the best “item” I’ve ever had! I got two short rib tacos and a spicy pork taco. The short rib tacos are the most popular and highly recommended dish on the menu. These tacos are what made Kogi BBQ famous. They were delicious.Very flavorful and the perfect combination and texture with the slaw and salsa. They have just the right amount of spice and the meat is so tender and flavorful. It definitely has an asian flare to them, they don’t taste like your traditional Mexican tacos, especially the short rib tacos. They are different and delicious. I really enjoyed them- highly recommended. They are messy but so good. 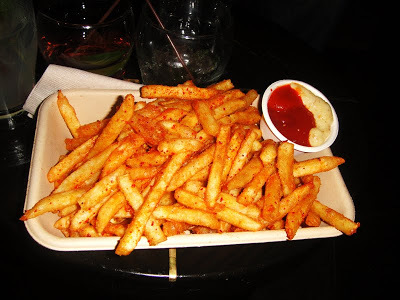 The Alibi Room is a great place for good food and drinks for a reasonable price. The food is cheap and delicious and overall the place just has a great vibe. They serve Kogi BBQ from 6pm-12am Monday-Saturday. I recommend their famous tacos and get the spiced fries. If you want to track down the Kogi Truck, follow them on Twitter to find out their locations. Check it out!